Former Marine Lance Cpl. Josh Onan was in Ramadi, Iraq, in 2006 when his Humvee was hit by a roadside bomb. "I remember laying down in the truck," Onan said. "Waking up, there's dust, there's debris all over me, and there's an Iraqi colonel who's sitting in the truck with us, and he's just screaming, screaming. I don't understand what he's saying." Onan suffered a head injury and post-traumatic stress disorder. During the next year, he was in and out of trouble with military officials, mainly for small infractions, which he chalks up to the medications he was taking. Then, while on leave, he was caught with a small amount of cocaine and kicked out of the Marines. Onan is one of the thousands of veterans who have other-than-honorable (OTH) discharges. They don't typically qualify for VA benefits, even though many have service-related trauma. And as a group they have a high suicide rate. To address that, the VA last summer started a new program. It allows OTH vets to come into the VA to receive mental health care, at least for 90 days. "I'm 32 years old now, and this guy's 20, and I look up to this guy," he said, his voice breaking, as he looked at an old photo of himself. "I know it's me, but I miss everything about him. Sometimes it's hard to find this guy." The VA last year estimated there are more than 500,000 OTH vets. Nationally, 115 veterans have used the program, a figure that's disappointing to veterans advocates. They say it represents just a small fraction of the veterans who now qualify for mental health care. "It's not possible that that's the number of people who need help," said Kristofer Goldsmith, an Iraq vet who works with the Vietnam Veterans of America. "It's a failure to contact them, to fully inform them and to break the stigma." "It's a program that most people who are eligible for don't know about, and the reason for that is that VA refused to do any outreach," said Vietnam Veterans of America executive director Rick Weidman. Weidman said there was an internal debate over whether the VA could pay to reach out to veterans who normally don't qualify for VA care. "They came in saying they had an urgent need, and they were evaluated and received care for that urgent need - whether it was a substance use disorder or suicidal thoughts," said Dr. Neal Doran of the San Diego VA. The VA defends the effort. Dr. Keita Franklin heads the agency's suicide prevention programs and says the VA tried to get the word out through veterans' organizations. "We rolled it out rather quickly," said Franklin, "and we just did universal messaging across the board, just to get the message out, writ large across the nation. Now we are in programming with the Department of Defense. " The old 90 day program is getting a much larger mandate. Earlier this year Democratic Sen. Chris Murphy of Connecticut was able to push through legislation that will require the VA to treat vets with other than honorable discharges whose mental health issue is related to their service. "If you have PTSD and because of that PTSD you act out," Murphy said, "you should not lose eligibility for your veterans benefits. That's what's been happening." "VA is currently in the process of writing implementation regulations which will provide further guidance on expanding mental health care outreach to service members in need," the agency said in a written statement. The VA is now also required to actively seek out the veterans who qualify. But Onan said finding those veterans - and persuading them to seek out VA care - will still be difficult. "I felt shunned. I still feel shunned," Onan said. 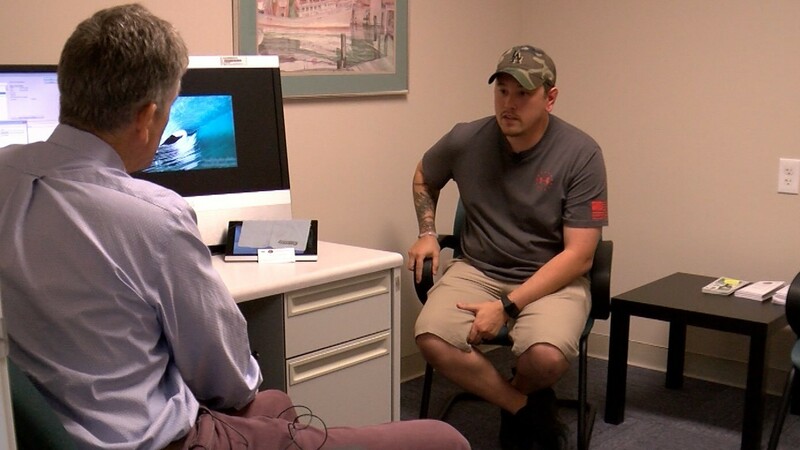 He said treatment has been a lifesaver for him, but he fears the alienation he and other vets feel will make it difficult for some to seek help. "I wouldn't be surprised if most of them weren't alive," Onan said. "And the reason I say that, is without treatment and without proper care...I don't think I could have done it without God and my family."